The trick is, the father could be any of the male leads! 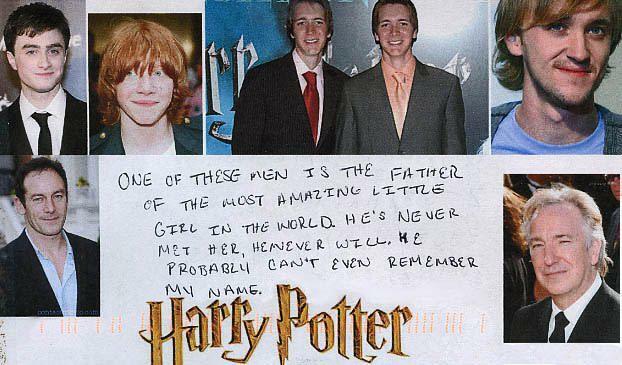 Daniel Radcliffe, Rupert Grint, Tom Felton, Oliver and James Phelps, Jason Isaacs and Alan Rickman’s faces all appear on a ‘Harry Potter’ postcard that was allegedly mailed to Postsecret.com. If you are unfamiliar with Postsecret, it is a website run by author Frank Warren, who encourages his millions of readers to mail him (anonymous) postcards with a secret confession. The sender had quite the shocker to share! Co-stars Oliver and James Phelps, who play twins George and Fred Weasley, have also taken to their Twitter accounts to clear themselves of future nappy duties. Radcliffe, Grint, Jason Isaacs and Alan Rickman, have yet to comment on the claims and have not made any public statements regarding the matter. In other Harry Potter news, Warner Brothers fat cats are plenty thankful during this holiday season, as “Harry Potter and the Deathly Hallows, Part I,” has past the $170 million mark domestically at the box office. If you live under a rock, “Harry Potter and the Deathly Hallows” is the seventh and final book in the J. K. Rowling magical series. The final book has been split into two parts. Part one has been playing at your local theater since November 17th, and whether you have a Griffindor scarf or not you will LOVE this film! Part 2 of the movie is slated to hit theaters in July, 2011.